That is what a small group of dart enthusiasts set out to do with DartConnect. The game of darts has a great legacy with a strong social bond. Occasionally, even 100 year old traditions require a makeover. It’s time to replace the chalkboard. A big ongoing thank you to all the DartConnect enthusiasts who selflessly promote us – you are the reason we can continue to invest in the platform, to make it better. We believe that by making the game of darts more accessible, more people will play. Darts is not an easy game to master, especially for the uninitiated. DartConnect minimizes the scoring process, while breaking down the game elements through statistics and reporting. Ever finish a match and wonder where all the time went? Preparing/erasing the scoreboard, calculating scores, correcting entries and documenting progress, all steal dart time. DartConnect speeds up match play so you can shoot more darts, in less time. Can’t find an opponent? Play against DartConnect. Unequal player skill levels preventing competitive games? Handicap one player. Can’t make it to your favorite dart venue? Play Online. DartConnect is always available, wherever, however you want to play. 2019 looks to build on 2018’s rapid international growth, as steel tip enthusiasts from everywhere in the world expand on DartConnect’s global footprint. DartConnect’s Digital Steel Event Services now power tournaments in over a dozen countries and allow fans everywhere to follow their favorite players progress from anywhere in the world with Free DCTV Fan Alerts. Check our website for new and exciting tournament coverage every week. 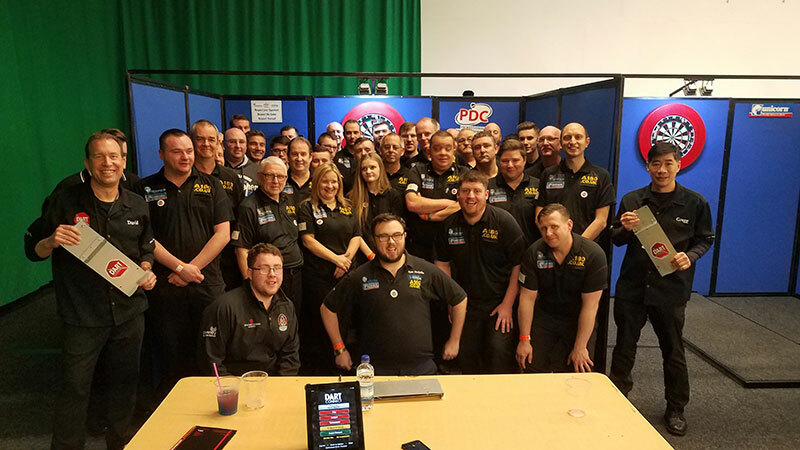 In addition, we are very excited about our continued partnership with the PDC and the JDC, to promote the professional side of the sport for both established and aspiring players. An ongoing thank you to every individual who has signed up for a personal membership. Your support enables us to continue to reinvest in the services we provide, with new features rolling out regularly. We hope you will join us. Shoot well! Special thanks to everyone who joined, played, tested and offered hundreds of suggestions – many of which have been implemented. While there is much work to do, we would not have made it to this milestone without you. Everyone who enjoys DartConnect from now on owes you a debt of gratitude. May they buy you a pint when they meet you at the throw line!